IDEAL weather conditions required for growing plants are hardly available across the world. This has given boost to greenhouse farming or cultivation of plants inside a building with glass or plastic walls and roof under controlled conditions to get maximum yield. Organic and inorganic substrates, surface on which an organism grows, play the most important role in this type of farming because soil cannot be used. “Over a period salinity and alkalinity of the soil changes. It may get infected by fungus,” says Balraj Singh, head of the Centre for Protected Cultivation Technology, Indian Agriculture Research Institute. These are detrimental to plant growth. Therefore we need to replace soil with substrates, he adds. The substrates are chosen on the basis of physical and chemical properties necessary to support specific crops and growing conditions. One important physical property in substrates is air-filled pores that allow for gas exchange between plants’ roots and the outside atmosphere. Currently, perlite and parboiled rice hulls are the common components used to increase air-filled pores in substrates. But both have limitations. Perlite, a natural glass of volcanic origin that expands when quickly heated, has become expensive due to costs of mining, transportation, and production. In addition to its rising price, perlite produces a siliceous dust that is an eye and lung irritant. Parboiled rice hull (PBH) is produced only in specific areas of the US, making high shipping costs an issue for end-users. Being a plant-based component PBH decomposes quickly. Now a study by researchers from University of Arkansas led by Michael R Evans has shown that growstones, an aggregate produced from finely ground waste glass can replace perlite and PBH. They found that growstones had an air-filled pore space higher than that of both PBH and perlite. It increased the gas exchange between plants’ roots and the outside atmosphere by 25 per cent. It also has higher water-holding capacity and is cheaper. 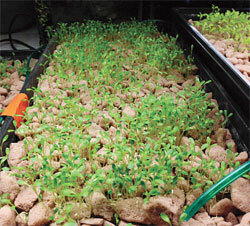 The results of the experiment will be published in the February issue of HortTechnology. “We are in need of greenhouse farming as there is no land but population is increasing,” says Singh. Cheaper substitutes to soil can help more farmers undertake greenhouse farming, he adds.